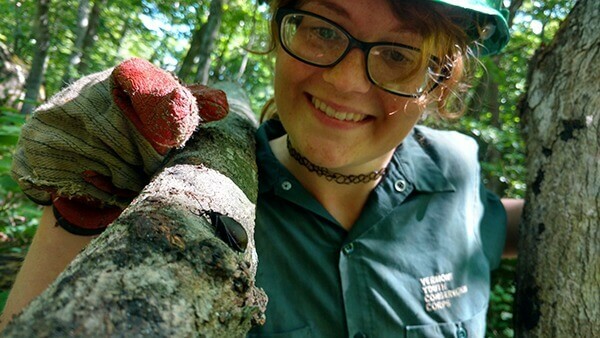 Melissa Doodan wants to pursue a career in forestry and is learning career skills through Vermont Youth Conservation Corps and AmeriCorps. College students and recent college grads seeking service-oriented opportunities that also help build unique career skills can do so through AmeriCorps. AmeriCorps is a program of the Corporation for National and Community Service (CNCS), an independent federal agency whose mission is to improve lives, strengthen communities, and foster civic engagement through service and volunteering. That’s the type of career development Melissa Doodan is pursuing. Doodan wants to pursue a career in forestry and is working towards that goal as a Crew Leader through the Vermont Youth Conservation Corps (VYCC), a non-profit youth, leadership, service, conservation, and education organization that is a partner under the AmeriCorps umbrella of organizations. The skills someone gains through AmeriCorps depends entirely upon the organization with which they work, says Naomi Galimidi, Development Director, Vermont Youth Conservation Corps. AmeriCorps members benefit from gaining real experience in the professional world. Winkler of Reading Corps and Math Corps says that in the case of their tutors, the real-world experience of being in a school and working directly with students can be very beneficial to someone going into a career in teaching or education. VYCC, headquartered on historic Vermont farmland, gives its service members a taste for a 9-5 workday. During the day, corps members are immersed in learning by doing projects that range from pulling invasive species along floodplains to the custom design and construction of composting toilets in state parks. This ensures opportunities that can accommodate a range of skill levels, says Galimidi. How to understand that effective leaders inspire and create an environment where others can grow. How to build confidence in sharing ideas, solving problems, adapting to new situations. How to demonstrate confidence through eye contact, a strong handshake, and initiating conversations. These are all important, and crucial skills valuable in today’s workplace – no matter what type of job or career one pursues. In fact, according to the National Association of Colleges and Employers Job Outlook 2017 report, a college grads ability to work as part of a team is the top skill employers covet (78 percent of survey respondents indicated as the No. 1 skill). Other top skills were problem solving, communication (both written and verbal), and a strong work ethic. These are all gained through the various AmeriCorps experiences available to pursue. “Supportive relationships create conditions for all members to try new things, rely on one another, share power, and expose one another to new ideas and experiences,” says Galimidi. One of the misconceptions of AmeriCorps is that opportunities are only available for those seeking outdoors-related careers. However in 2016 the Corporation for National and Community Service (CNCS), the federal agency that administers AmeriCorps, announced major expansions of STEM AmeriCorps that will support STEM mentoring opportunities for young people. STEM jobs – Science, Technology, Engineering, and Math, are in-demand, and job seekers with those skills will be sought-after by employers seeking skilled/trained workers. Minnesota Math Corps tutors, for example, work toward filling that skills gap. Math tutors work with students grades four through eight who are falling behind in math. In addition, some non-profit organizations in Silicon Valley have partnered with AmeriCorps for technology-driven service opportunities. In the article How AmeriCorps Works to Get You the Job, Ben Duda, Co-Executive Director at AmeriCorps Alums, a community of engaged citizens and civic leaders who either work or previously worked with AmeriCorps, said working with AmeriCorps helped develop career skills such as project management, facilitation, and community engagement. Most important, working with AmeriCorps develops transferable skills for any career path. “There are hundreds of jobs out there, and it’s incredibly exciting to see how AmeriCorps alums are utilizing their service experiences to succeed in a diverse array of careers,” said Duda. Serving with AmeriCorps helps people work in challenging and structured, informal experiential learning opportunities, be that outdoor physical work, a school or other setting. Clear expectations are set, and participants gain a sense of accomplishment, while having a safe place to try new things and learn from mistakes. “AmeriCorps is an investment of your time and passion, but it’s also an investment in yourself,” says Winkler. Discovering your true calling and being pointed in the right direction can be the greatest benefit. An AmeriCorps service position can provide a foot in the right door. For example, members of VYCC work closely with representatives from state and federal agencies including the US Forest Service, US Fish and Wildlife Service, National Park Service, Vermont Agency of Natural Resources, and Vermont Agency of Transportation. Ken Brown worked for VYCC in 2007 as a park manager at North Hero State Park. Today, Ken applies his passion for recreational management as Regional Trails Coordinator for Vermont Department of Forests, Parks, and Recreation. Tutors with Reading Corps and Math Corps have said that their service helped them land a job in the same school district after their service, according to Winkler. For tutors who don’t pursue a teaching career, the skills they gain can benefit them no matter what career they choose. “Tutors who use service as a gap year between undergraduate and grad school have furthered their education in medicine, science, education, social work and counseling, among other fields.” Winkler says they find Reading Corps and Math Corps tutors in a wide variety of professions after their service. Doodan hopes to launch her forestry career, using VYCC as a first step. She – and thousands of other young, aspiring professionals – are on the right path, thanks to skills learned through the many diverse AmeriCorps programs. Ready to search for AmeriCorps positions? Search on CollegeRecruier.com today! Want more career advice and job search tips? Stay connected to College Recruiter by visiting our blog, and connect with us on LinkedIn, Twitter, Facebook, and YouTube.